Travertine is one of the most luxurious and most popular surfaces for bathroom remodels in the last decade, but it has not been without it's flaws. Being natural stone, to try and get it to look like this picture was a labor intensive and highly expensive feat. Slabs of any stone are extremely heavy, therefore costly to purchase and install, requiring several men just to lift and put your stone in place. Then there's the typical, lighter but not so less intensive method of application- travertine tile. While beautiful and offered in thousands of styles, patterns and colors ranging from lower cost and lower quality Mexican travertine to the costlier Turkish variety, owners of this beauty had the horrors of natural stone maintenance to contend with. Travertine is an extremely porous stone, with random veining and pitting allowing bacteria to fester in any moist environment. 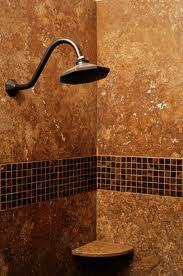 Tiled showers also have grout lines which, even when sealed, change color from dirt, mildew and age. Forzastone offers a beautiful, affordable solution to homeowners who seek the luxury of travertine, with the ease of maintenance available in a standard shower surround. Forzastone is a lightweight, natural travertine or marble panel that installs with NO grout and in less than a day. It comes in six varieties of travertine and two different marbles, offering you endless looks when combined with a decorative tile border, like the shown here with a marble mosaic. Forzastone is comprised of many layers, blending the highest quality natural stone with the best in technology to bring you luxury for your bathroom that boasts a LIFETIME WARRANTY. The stone itself is a sealed 5mm slab mounted on a reinforced metal alloy, which is then mounted on a 4mm reinforced plastic ply laminate, which is mounted on another reinforced metal alloy. Cleaning and maintenance are a breeze because each panel is pre-sealed and 100% waterproof, and I have to say it again... NO GROUT! Forzastone cannot be purchased by homeowners, as it must be installed by a certified installer, ensuring proper installation of the product and no void of your warranty. As a designer, I'm having fun creating unique bathrooms with interesting combinations of Forzastone and porcelains, glasses and other natural products on decks, counters and walls. For more information on this phenomenal new product and their range of colors, please check out their website at www.forzastone.com. Clients in the Phoenix- metro area interested in this product for their homes, I'd love to work with you to create a luxurious lav with old world appeal or cutting edge modern looks. Please reach me at 480-227-1832 or use my Contact Me page on this website and let's begin your journey into maintenance-free world of Forzastone. To all of my friends in the trade interested in using Forzastone in your own projects, please contact Jay Dunbar of J&M Custom Millwork & Remodeling. He's a certified installer who has done several installations throughout the valley. He's fast, professional and will make working with your clients on their bathroom a joy! He can be reached at 480-206-9183 or at his website at www.jmcustommillwork.com.